This was a game, set in Greece, in 1941. Neither side knew the OB of the other. Each side were given a set of forces, each with a points value and a number of points to effectively buy an army. It was an encounter game and I developed an abstract reconnaissance system. The objectives were as follows. The Germans were to clear and hold the main highway and push back or destroy the British forces. The British were to control the main highway, keeping it open and deny the Germans the control of the same highway. The idea was that the Germans were coming out of the mountain passes and the British were protecting their lines on communication to the ports. The German forces would be based on "Das Reich" Motorised division with a maximum tank complement of 3 Stugs and 3 Pz IIIs. This is a top notch formation. The infantry components are treated as standard infantry for rate of fire, not enhanced as in later years. The British forces would be based on components of a British Infantry division with transport, one without transport and an Armoured division. There was also the added flavour of British Guards, Highlanders and normal experienced regulars. The Germans have air support along with air supremacy. Although there was a virtual guarantee of German air support during the game, how much would appear and when and where was randomly generated. The Germans were grateful when it arrived but had no other control on the aircraft. 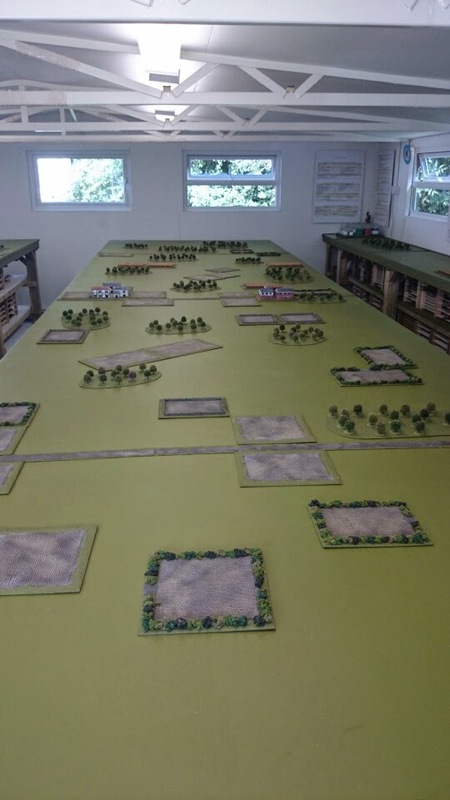 The first two piccies show the battlefield. North is to the left and west is nearest shot. This is the southern half of the battlefield. There were only two villages on the battlefield, both along a central main highway. There were two other north/south roads, one to the east and the other in the foreground to the west. The German army was based on 2 Motorised Infantry Regts, a Reconnaissance btn, a Stug company and a towed Panzerjaeger btn. The British army was based on an 2 Infantry brigades with transport, one without transport and a Reconnaissance Regt from an Infantry division. None of the armour was selected! 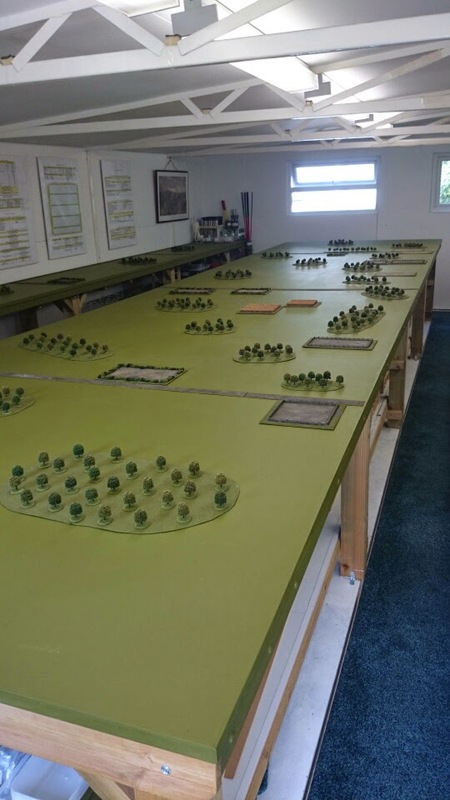 The action would be virtually all fought on the southern table sector. The reconnaissance saw the British set up in quite an advanced position in the East, but very close to the southern edge to the west and about in the middle of the battlefield in the centre. To surmise, the British attacked on the eastern road with an Infantry Brigade supported by most of the reconnaissance regt, against a German column based on 2 Motorised btns with 3 Stugs and half the reconnaissance btn, also attacking. This fight would hang in the balance for quite a while until the British eventually ran out of offensive steam and began a dogged withdrawal. In the Centre, a British Infantry Brigade, with little armour of any description, was quickly forced to mount a defence based on the village, furthest south on the main highway. It would take the German attacking force of 2 Motorised btns, supported by both regts heavy weapons, most of the weekend to box the British into the village and surrounding area. To the west, the British attempted to get forward from a poor starting position with an Infantry Brigade and reconnaissance company. The Germans exploited there good starting position with 2 Mororised btns supported by the other half of the reconnaissance btn. The main battle would take place in a large wooded area, not far from the southern edge, with German firepower eventually prevailing. Some piccies of the action. This is the taken from the Garden areas which are just to the right of the village in the piccy below, so the village is to the immediate left. These Stukas arrived and played havoc with the infantry!! The number of Stukas, the road they arrived on and the direction they were travelling, was all random. Aircraft had target priorities if multiple targets were visible. This shows the village on the main highway. It took a short amount of time for the village to be the key focus of fighting in the centre. The British were always on the defensive and somewhat bottled up. Progress by the Germans was slow, but speed and casualty rate are a fine balancing act! The above is from the road on the west of the battlefield. The fighting would concentrate on this wood and the surrounding enclosures. Graham, in the centre, either looking at the bad news coming towards him or telling off those nasty Germans. Me in the foreground, looking at how to prise open the village defences. Pete and Gordon in the background, fighting tenaciously over the eastern road. Pete would eventually start giving ground, grudgingly! The above piccy and the rest that follow are from a different camera with a professional man doing the piccy taking. John Smith is behind the lens and has managed to escape the other photographs! The above piccy shows how transport is done. Vehicles are assigned to companies and is also a fixed asset. If a truck is destroyed, then that formation has lost some transport for the duration of the battle. Another piccy of the intense fighting in the woods on the western road. The Germans prevailed through weight of firepower, but it was a slow and not easy advance. Casualties on the German side were mounting, but the British were being sucked into the killing area. Below is a wide angle shot of the village on the main highway. It also shows German armoured cars now working to the southern board edge to completely cut off the British brigade now in this area. This is the same village, piccied form the southern board edge looking north westerly. The troops on the right edge of the picture are German, the enclosure of the village and the troops in it is nearly complete. This saw the end of the game. The troops density was the lowest we had used for some time and all formations had a wide area over which to manoeuvre. The Germans were slightly surprised at seeing no British tanks. The British tactic was to try and hold the centre and western road and advance and achieve victory on the eastern road. The German approach was to have the faster elements on the eastern and western roads and methodically crunch through the main road. The conclusion was that the British would have to withdraw or seriously risk being cut off and eliminated a static pockets. The next jaunt will be back to 1809 and the battle of Aspern Essling again. It will be very different with more terrain in that the Granary and church are there, all the troops are there and all the rules are being played, including command and control.